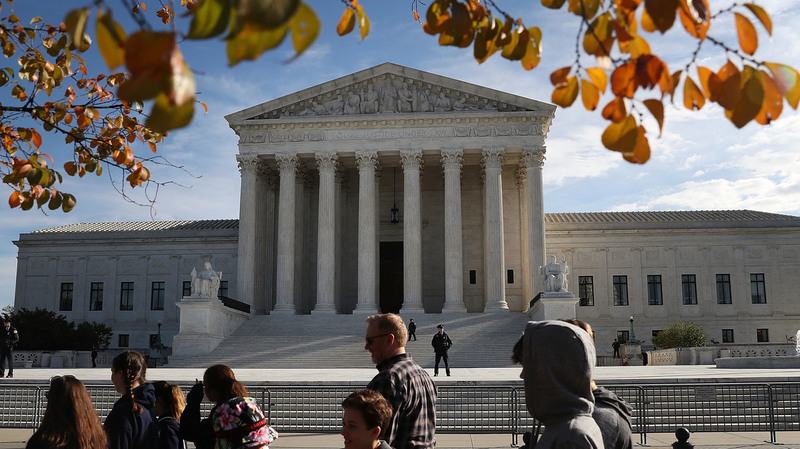 Supreme Court Appears Ready To Make It Harder For States To Confiscate Property The U.S. Supreme Court heard arguments Wednesday about one of the few remaining provisions in the Bill of Rights not yet applied to the states: the ban on excessive fines. The U.S. Supreme Court heard arguments Wednesday on whether a state has to adhere to the Eighth Amendment's excessive fines clause. That could have consequences for civil forfeiture in crimes. At the U.S. Supreme Court Wednesday, a majority of the justices seemed ready to make it more difficult for states to confiscate cars, houses and other property that is even tangentially used in the commission of a crime. It's a process legally known as civil asset forfeiture. That would be a victory for Tyson Timbs, whose $42,000 Land Rover was seized by the state of Indiana after he was arrested for selling a small amount of heroin to undercover cops for $400. A trial judge ruled that taking the SUV was a grossly disproportionate punishment, on top of other fines and a year of house detention. An Indiana appeals court agreed. But the state Supreme Court ruled that the Constitution's ban on excessive fines, unlike nearly all the other provisions of the Bill of Rights, has never been applied to the states. On Wednesday, Indiana Solicitor General Thomas Fisher defended that proposition in the U.S. Supreme Court, facing a chorus of skepticism from justices, conservative and liberal. Justice Neil Gorsuch led off questioning Fisher. Whatever the scope of the excessive fines clause, he said, "can we at least agree" it applies to the states? Not when the fine is levied against property, as it is here, Fisher said. "Really?" shot back Gorsuch, "Come on, General!" Justice Stephen Breyer hypothesized about the limits of Fisher's argument. Could the state, he asked, seize a "Bugatti, Mercedes or a special Ferrari, or even jalopy" if the driver was speeding 5 miles an hour over the limit? "The answer," the pained-looking Fisher replied, "is yes." Arguing the contrary position was Wesley Hottot of the Institute for Justice, representing Timbs. Chief Justice John Roberts offered the most aggressive questioning, observing that there is a "well-established" distinction between fining someone $500,000 and confiscating assets used in a crime. Hottot replied that confiscating property is "a very different animal" today than it was hundreds of years ago when pirate ships were the object of civil forfeiture. In contrast, he said, today police can go after every person's property, even in cases where the owner of the property is blameless and has not been charged. Justice Samuel Alito pointed out that in this case, Timbs had been convicted of a crime. That's correct, Hottot replied, noting that the trial judge in this case sentenced Timbs at the low end of the scale and ruled against the state's attempt to confiscate the truck, saying it was disproportionate. Several justices wanted Hottot to clarify whether he was asking the court to adopt a proportionality rule. Not at this stage, Hottot said. All we are asking is that the court overrule the Indiana Supreme Court and declare that the Constitution's ban on excessive fines applies to the states, not just the federal government. That, he said, would give the lower courts the opportunity to work out what standards to apply. Roberts opined that that may be like asking the court to buy a "pig in a poke." "You say, don't worry what it means," Roberts said, "just incorporate it [to apply to the states] and then figure it out later on." Timbs was at Wednesday's argument. He said he isn't sure what his once-glorious SUV is worth today, even if he gets it back. But not having a car has been a problem not just for him but for the aunt he lives with in rural Marion, Ind. He is now clean and has a job as a machinist 35 miles away. He is able to get to the job only because his aunt lets him use her car. "I've been lucky," he said. "Most people don't have an Aunt Wendy. ... She's on dialysis three days a week, and because I have to use her car to go to work, so we can pay bills, she has to take the bus to get to and from her dialysis." William Conlon contributed to this report.